With Valentine’s Day quickly approaching, people everywhere are thinking about the things that are most important to their hearts. Although love and affection may fulfill emotional needs, your heart’s other needs must be attended to as well. Here are some tips for keeping your heart healthy and fit – not just for Valentine’s Day, but for years to come. For optimum heart health, it’s best to get at least seven hours of sleep every night. Without adequate sleep, your body can produce large amounts of cortisol, the stress hormone. This leads to plaque build-up within the arteries, as well as higher blood pressure. To ensure that your sleep is restful, avoid stimulating activities right before bedtime, such as drinking beverages that have caffeine. Protect and strengthen your heart with foods known to promote heart health. They include whole grains, raisins, yogurt, nuts, fish, dark chocolate, beans, berries, apples, tomatoes, green tea, and bananas. Also, carefully check food labels. Avoid foods with high fat content, but keep in mind that not all fats are treated equally. Good fats, such as omega-3 fats, are essential to both physical and emotional health. Regular exercise on a daily basis keeps your heart strong and reduces your risk of developing serious medical problems, such as heart disease. 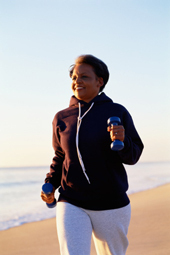 The Mayo Clinic recommends exercising for at least 30 to 60 minutes every day for the best results. When possible, add weight training to your routine to strengthen your heart and increase the effectiveness of aerobic workouts. Schedule regular medical checkups. Ask your doctor about screening for heart disease risk factors, such as high blood pressure, diabetes and high cholesterol. Diabetes screening tests often are first prescribed between the ages of 30 and 45, depending on a person’s medical history and other factors. Generally, cholesterol should be measured once every five years, beginning at the age of 20, and screening for high blood pressure should be once every two years, beginning in childhood. Consuming too much salt raises your risk of developing high blood pressure, which is one of the primary risk factors for heart problems. Likewise, when your blood pressure is already high, reducing the amount of salt you eat can lower your blood pressure. According to the Centers for Disease Control (CDC), no more than 2,300 milligrams of salt should be eaten each day. We hope these tips will help you enjoy a healthier lifestyle. Happy Valentine’s Day!